Please contact me about shipping options before buying!!! Custom made 1/2 scale F-14 Tomcat port side Tail. This tail is custom made, with whatever livery you wish from the Ship you were based on, or whatever Fighter Squadron’s Art Work you’re a fan of! Perfect Wall Art for your Office or Home. There’s NO way people won’t notice this on your wall. I’m a US ARMY Veteran and enjoy building Military Aircraft Inspired Art. It’s custom made in my shop and takes approximately a month to build depending on details and paint. It is made from 5052 Series .050″ Aircraft Aluminum sheet, frame sections are fabricated and bent in 4 places each for strength from scratch, and it’s flush riveted to the frame with 997 (on this actual tail) aluminum aircraft rivets, all hand set with a river gun. 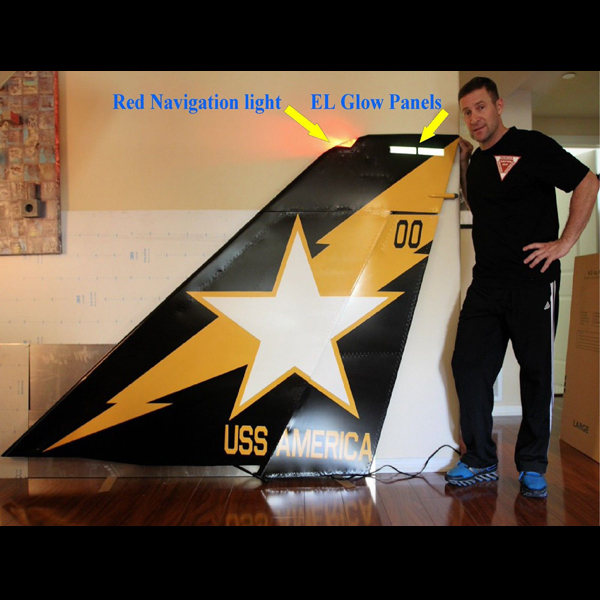 The rudder moves back and forth and there is a functioning Red Navigation Light as well as an EL Glow Panel similar to those used in Aircraft Carrier Borne Military Aircraft, with switches for each light. The Tail weights approximately 32 pounds and is shipped in three pieces. Assembly on your end is about 5 minutes. Red Navigation light is subject to availability, it may have to be scratch built, but I can do that too. Price includes a hefty 135 pound shipping crate if you want a very secure crate, but I can make it out of thinner Plywood and thinner lumber to save weight as well. This particular tail measures 5 feet, 3 inches tall and a nearly 7 feet long! As seen in the picture in the crate, this is the largest size I can build it and still fit in a 4×8 foot Plywood based crate. Larger is possible, but crating would become expensive. (This crate is $93.00 just in the wood materials). You will pay for actual shipping. It’s also possible to just wrap it in furniture blankets and have a shipping company strap it to the wall of a truck, which would probably be fine. You pay for the crate materials (not the labor to build the crate) and actually shipping charges. Thanks for checking it out, I will be adding professional pictures after its clear coated this weekend. It’s $498.40 for Fed Ex Freight to ship this particular Tail from Pasadena, CA to New Mexico. Your Tail will ship from Las Vegas, NV.